Lyralen Kaye, SAG/AFTRA, AEA, has won writing awards in every genre. 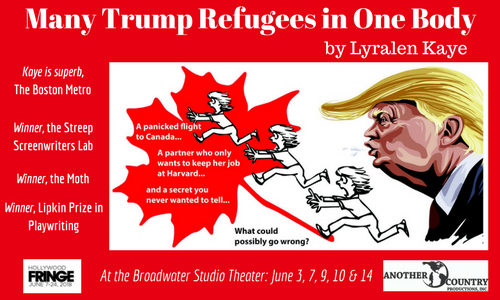 Many Trump Refugees in One Body, directed by Caitlin Inglis, assistant directed by Marc Ewart and dramaturgy by Lisa Merchant, is the hilarious story of an queer feminist’s struggle to claim a new country. The story opens on election night, November 8, 2016, and moves quickly to Kaye’s decision to immigrate…on November 9! Kaye is a professional actor and award-winning writer and storyteller. Most recently she won the Moth Story Slam and the Boston Story Slam and was a finalist for the Black List Women in Film competition. Her other wins include the Meryl Streep Writers Lab, the Stanley and Eleanor Prize in Playwriting, the Boston Amazon Poetry Slam and Slam Finals. She has a Pushcart nomination in fiction, and finalist credits for the Half the World Literati, the Massachusetts Council of the Arts Awards the Roy W. Dean Prize in Screenwriting and the Pride Films and Plays Awards. She believes in keeping your sense of humor while fighting for social justice, and laughing at yourself whenever possible.